Take a bow, Burbank. You deserve a big round of applause. Beginning in fall 2014, the students and teachers at Burbank Elementary School in Hayward, CA, embarked on a new and ambitious program to integrate arts across the curriculum. It’s a natural fit for a school community whose mission includes cultivating and cherishing “an environment that supports the academic, social-emotional, creative and civic learning” of all students. After studying the artwork of Pop artist Andy Warhol, fifth and sixth grade students made artwork inspired by his creations. Students were prompted to find images that represent contemporary pop culture, and then to use Adobe Photoshop Elements to create their own Warhol-inspired work. They learned how to manipulate various Photoshop Elements tools to crop, select, paint and fill select areas of their work with contrast colors. In another project, students used Photoshop Elements to create typographical portraits of people and characters they researched in class. Each student learned how to create brushes from words related to their subject matter. They found images of their subject matter and applied filters to convert the images to black-and-white. Then they isolated the black areas and replaced them with the new typographic brushes they’d created. The finished pieces are portraits constructed from typography. These innovative art programs are the brainchild of Robert Hoang, who joined the Burbank team last year to teach visual arts to K–6 students, and to work with his colleagues to plan arts integration lessons. Hoang co-leads Burbank’s partnership with Turnaround Arts: California, a signature program of the President’s Committee on the Arts and the Humanities that seeks to advance education in a select group of elementary and middle schools in the state. To support this work, Hoang secured a software donation from Adobe & ConnectED to help increase technological literacy for Burbank’s students by integrating digital media into the art curriculum. Adobe is a big fan of Burbank Elementary and Turnaround Arts, but we’re certainly not alone. Turnaround Arts matches each of its partner schools with a celebrity mentor. 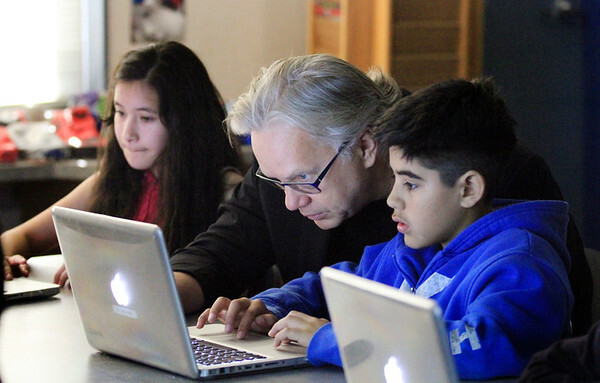 Earlier this year the students at Burbank enjoyed a visit from their mentor, the actor Tim Robbins. U.S. Representative Eric Swalwell talks with students about their projects. Building on the success at Burbank, Adobe is expanding the ConnectED program in the Hayward Unified with the goal of getting free creativity and eLearning software and teacher training to all of the district’s Title I schools. If you know of a Title I school that could benefit from Adobe & ConnectED, please direct them to our website for more information. Learn more about Burbank Elementary School, Adobe & ConnectED and Turnaround Arts. As part of President Obama’s ConnectED Initiative, Adobe is donating over $300 million in software and professional development services to schools across the United States. Introducing a free, practical guide to creating digital media in any academic discipline. ©2019 Adobe Systems Incorporated. All rights reserved.